ABERDEEN, Scotland — Striving to improve behavior at soccer matches, FIFA President Gianni Infantino sees women as role models for male players. "The men's game has developed incredibly, positively, but a few maybe side effects have unfortunately developed as well that we are fighting now," Infantino said Saturday. "Let's take the example of the women's game." 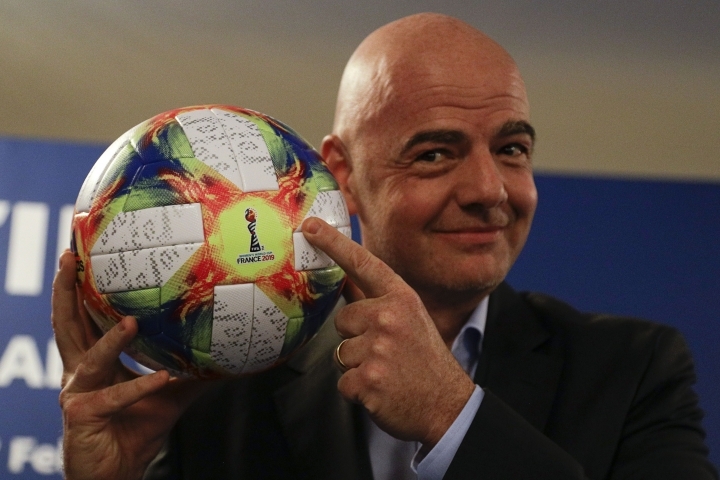 "Women are nicer than men, probably, generally," Infantino said. "Sometimes we men feel that we need to show how strong we are, probably in the human nature, and this is reflected as well in some of the behavior in society in general but also on the football pitch." "When it comes to behavior," Infantino said, "if there's something to learn from the women's game ... it's certainly this: This is much less time lost and wasted on simulations or on other situations we criticize in the men's game. We are intervening now." Such as ensuring someone substituted "doesn't greet all the players before going out (leaving the pitch) and so on — wasting time," Infantino said. "All the things you don't see in the women's game." "Players now know that it's not just sufficient to have a look where is the referee, so if he doesn't see me I can simulate, because he or she will be caught," Infantino said. "That's why VAR automatically helps the fight against simulation and diving in a very efficient way." In two changes affecting goalkeepers, goal kicks won't have to leave the penalty area and only one foot will have to remain on the line when facing a penalty.